Mesquite trees are found nearly everywhere in Texas. Prior to the settlers there were not nearly as many Mesquite trees as there are today. They are a tough tree that survives the droughts. The Native Americans used the pods to make flour. The settlers used the beans to create a jelly. So of course I had to try making jelly using the pods of the Mesquite tree. One gathers the pods when they have turned red or brown but do not harvest them from the ground. If they have holes on them don’t pick them. Do not let the beans sit around long after picking them or they will be covered with beetles. A friend decided to pick beans for me but left them out after harvesting them only to discover the beetles among the beans. I went looking for Mesquite beans one morning in the neighborhood where I live. I searched a large vacant property where I had seen Mesquite trees while picking Mulberries. Fortunately I had many trees to choose from. Some of the beans are bitter tasting so I went from tree to tree sampling the beans. I was looking for the sweet tasting beans. I not only needed a sweet bean but a tree that had lots of beans close to the ground. I wanted one that had clusters of beans to facilitate quantity picking. I was surprised also how many of the trees were just starting to produce flowers rather than beans. This tells me that the season for harvesting mesquite beans will be a long one. When I found the perfect trees I put as many of the beans as I could into plastic grocery bags. 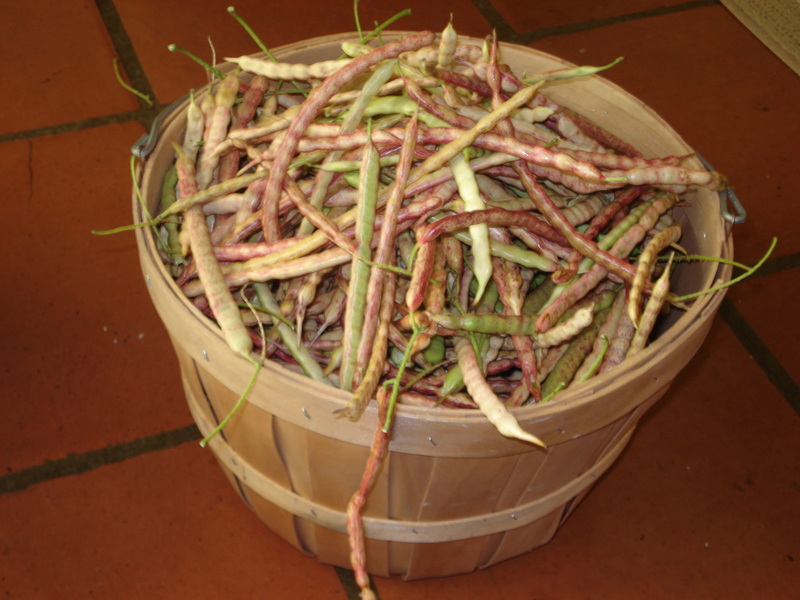 At home I rinsed the beans and then removed leaves and stems. I measure out 8-10 cups of bean pods. I then broke each bean pod in half. I put them in my large pot and covered them with 5 cups of water. I then proceeded to let it boil for 30 minutes. The resulting juice looked like weak tea. The liquid was run through a jelly bag. This tea was then used in my standard jelly recipe. Bring 4 cups of mesquite bean liquid and 1/4 cup lemon juice to a boil. Add 3 cups of sugar, stirring constantly, then after 1 minute of a hard boil add pectin. My friends have pronounced it delicious. Gallery | This entry was posted in Recipes and tagged Mesquite, mesquite bean jelly, mesquite jelly, Texan Jellies, Texas jellies, unusual jellies. Bookmark the permalink. Maybe this is the right comment section???? great! you found it. Now you can search for the topics you wanted such as dewberries. thanks for the mesquite bean jelly recipe. Been wondering about it for years. My yard in Austin is full of the beans. Jerry, glad you liked the recipe. Be sure to taste the bean pod to see if they have a good taste. Some are sweeter than others. I don’t know about the Houston area as far as Mesquite trees, but South Texas has plenty of them. Take a trip at the right time and fill your baskets with them. If you want the jelly ready made, I noticed a number of jelly makers who advertise on the internet. I’ve seen you mention that you tend to use freeezer recipies. Is this a freezer recipie also? Also, approximately what quantity of beans makes up the 4 cups of juice? I would suggest about eight to 10 cups of beans and at least 5 cups of water. Add more water if you end up with less than four cups of juice. I will say that the sheen of the juice/jelly can be a little startling at first since it has a greenish tinge. I would add 1/3 more pectin to this recipe to assure that it jells. And all of my recipes are freezer recipes since I choose not to can my jellies any more. Of course that means my freezer is always either full of juice, jelly and jam. I am a new jellymaker and very glad to have found your site. Last year I made prickly pear cactus jelly with pretty good results. This year I tried mesquite jelly and it is a little cloudy and stiff but has a nice honey like taste. Did I use to much pectin? and why do you prefer the no sugar pectin even though you add sugar? Thanks for sharing I really enjoyed your comments and recipes. Jacky- I am pleased you have enjoyed Texas Jelly Making. You asked why I prefer no sugar pectin but still use sugar. Since I use 1/2 the usual amount of sugar I can enjoy the sweet taste but not have as much sugar in the jelly or jam. As far as why your jelly was too stiff it could be numerous things. It could be too much or too little sugar, over-cooking, too little fruit or juice, or even too much unripe fruit in the case of those who add no pectin. Is there more to the recipe? What are the instructions for the jelly? Is it just like making mustang grape jelly? Erica- Yes, the instructions are the same. I will add the instructions. Thanks for bringing it to my attention. I traveled out to my favorite mustang grape vines last week and the fruit are getting big but they are not ripe just yet. I am going to check again in a week or two. Thanks for visiting the site. Sorry one more question! Is there a reason you use no sugar pectin vs reg sure jell pectin? I’ve read on several other sites that other people soak their mesquite beans in cool water before they make the “tea”. Why do they do this and do you suggest against I or do you have a preference? Erika- Thanks for commenting. One way or another the idea is to extract the flavor from the beans. I suspect soaking the beans makes them softer so that the cooking extracts more flavor. Another idea would be to cook them in a slow cooker. I felt that the flavor I extracted simply by cooking was enough but it is a matter of taste (literally). As far as why I use no-sugar pectin is that it allows me to use less sugar yet retain the taste that I enjoy in jellies. I don’t know how to use the “hot bath” method for canning and I’m planning on using glass jars with “lug” tops. Once I fill the jars, will they be okay at room temp or will I need to keep them refrigerated/frozen? Is this the Knox Pectin. How can we use jelly making pecten on these recipes. Thank you for visiting my site. What I use in my recipes is a pectin, particularly Ball’s no sugar needed pectin. Knox is a gelatin, a totally different product. Knox gelatin is used to gel liquids, create jams and form jellies. Pectin is derived from fruits, while Knox gelatin is extracted from animal collagen. Jellies and jams made from Knox gelatin will HAVE to be refrigerated or frozen. You will have to use different amounts of sugar and water. I made my first batch and it was very thin….didn’t jell up enough. I see from an earlier post that you recommend adding 1/3 more pectin to this recipe. I didn’t see that before I made my first batch. I’ve still go some “tea” left over and I’m going to try again. Is that what you think I did wrong….not adding the additional pectin? I have no idea what I’m doing! Sorry! Thanks for visiting my site. Another suggestion is to go “old school” in that you boil your batch and when you think it is done let it run off a spoon to see if it looks thick. If not continue to let it boil. You will be boiling off any excess water. It could be runny for various reasons: too much water, not enough sugar,or not enough pectin. I would certainly make sure that I monitor how much water I add to the beans and also use the extra amount of pectin. Let me know how it turns out. I really appreciate your help! One last thing….can I rerun the batch I’ve already made and add more pectin? Or is that batch pretty much a bust? There are wonderful directions for fixing your runny jelly batch at http://www.pickyourown.org/how_to_fix_runny_jam.htm Even though it says jam it explains how to fix jellies too. I have been making mesquite jelly for a couple of years now, and our friends and family love it. I want to try some Jalepeno Mesquite Jelly this year. Any suggestions on how to add little heat to the jelly? Every time I see all the mesquite beans in my neighborhood I wonder what else I could do with them. Your idea for a Mesquite-Jalepeno jelly sounds great. My suggestion would be to follow my recipe for chili pequin jelly, but use mesquite juice for the liquid, and increase the amount of chili (chili pequin) to 3/4 of a cup (Jalepeno). Let me know how it turns out. I am so happy to read about Mesquite Bean jelly. I acquired a recipe for this type of jelly years ago at the Texas Culture exhibit in San Antonio and was really looking forward to making this jelly, but unfortunately from all the moves I have made through the years it got lost. I so looking forward to making it. Thanks for putting it out there for people that like to make jelly. Marilyn- I am pleased that you found my site. I want to wish you good success on your Mesquite Bean jelly. Let us know how it turns out. Astrid- Glad you enjoyed the blog. Let us know how your jelly project goes. I was looking at the Mesquite trees yesterday trying to find a good area for harvesting this year. Joe-I noticed recently that the mesquite are at the perfect stage here in Texas for making jelly. As I mention in the blog be sure to taste the pods to determine if you like their flavor before picking lots of them. The taste varies from tree to tree. After you add the pectin, let it come to another hard boil for a minute and 30 seconds. Then pour into your containers and let cool before putting in the freezer. You also want to make sure it has jelled before you freeze the jelly. Even if you don’t make the jelly now you can boil the pods now before the weevils develop and make the juice. Freeze it and make the jelly later when the temperature is more agreeable outside. What an interesting blend. Do you know how many cups of blueberries? Did it still taste of mesquite beans or did the blueberry taste take over? When I have extra mesquite beans I make up the juice and freeze it. Saves space in my already stuffed freezer. I just crushed the blue berrys with a potato masher and im not sure how many cups I used in the finished products. I just put enough in to turn the batch into blueberry jam look…the blueberry taste didn’t over ride the mesquite taste. Thank you for sharing that blueberry/mesquite jelly/jam. Sounds tasty. should I use for the jelly? The short answer is that 2 pouches of liquid = 4 to 6 Tablespoons of powdered. But, there are several things to consider. 1. You will need a recipe for mesquite jelly that is made with conventional amounts of sugar rather than mine since mine use less sugar and are not canned but frozen. 2. Liquid pectin recipes are made differently. For liquid pectin, you bring all ingredients to a boil, boil for 10 minutes, then squeeze in the liquid pectin, boil for 1 minute, then process. Hope this helps. Looking to make nopales jelly (not tunas).., any suggestions? Jay-Haven’t heard of anyone making jelly from the cactus pads. If you find a recipe I’d love to see it. Kathy- Glad you could join us on Texas Jelly Making. I did an extensive search of the literature on jelly making and did not find a definitive answer. Probably because there are too many variables. How cold is the refrigerator? Was the liquid cooked? How long was it boiled? How long was it left out in the room? Mold and its toxins can grow in the refrigerator. So my answer has to be a definite “I don’t know”. If I have liquid left over I freeze it. In fact my freezer is mostly full of frozen fruit juices. If I was pushed for an answer I would recommend not using old jelly making liquid simply because it is not worth the risk. Wish I could give you a yes answer because I know how much work goes into the preparation of that liquid. 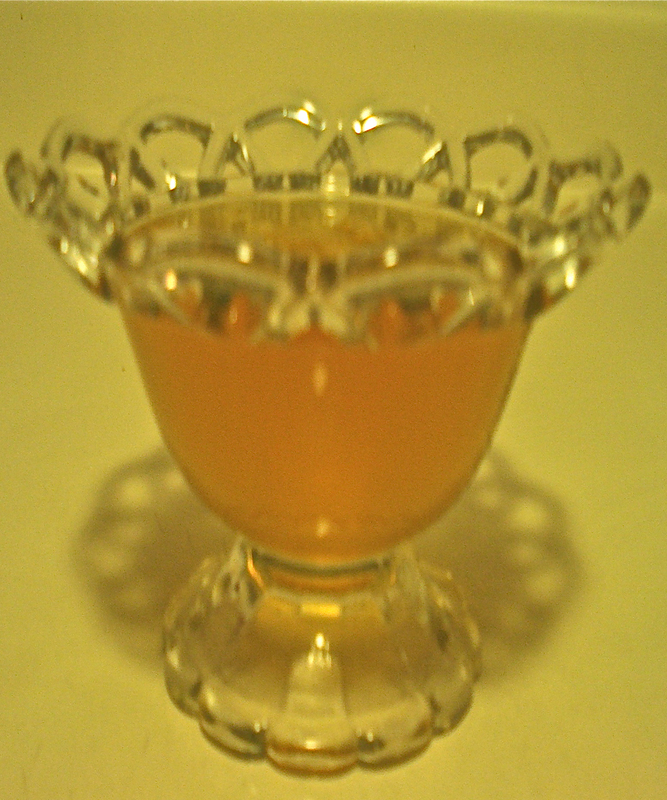 When I made my mesquite bean jelly it had a very noticeable flavor of the lemon. Is it suppose to be the dominating flavor? There are a lot of variables at play when making wild jellies. You might want to try less lemon juice since mine did not have a dominating lemon flavor. I have found the recipe to be way too sweet. Can I reduce the amount of sugar? I’m also going to try the Jalapeno additive on my next batch. I’m glad to see that someone already asked about it. I sure wished they had replied with how it came out. Tracey- The beauty of no-sugar pectin is that you can utilize the amount of sugar you want for the recipe and it will still jell so you can reduce the amount needed. Unfortunately that is not usually the case for standard pectin. The jalepeño will certainly add a kick to the recipe. I find a little jalepeño goes a long way. Let us know how it turns out. That’s good to know. I hope to make some very soon. I’ll post the results. Ok, I made it with only 1 cup of jalepeno and 2 cups of sugar. The nice kick comes about 20 seconds after you eat it. It is really good. I know the recipe says to boil for 1 minute after adding the pectin, but I read in my jelly making book to boil until it reaches 220 F or when it sheets (which happens at the same time). I discovered some time ago that this takes between 20-30 minutes after adding the pectin. How can I mix the jalepeno in the jelly instead of it all floating to the top? 2. Wait about 20 minutes after placing in the container, and then shake the container. If it has started to jell, the contents mix throughout. I have a lot of mesquite trees about 12 miles away to pick from and am having a hard time determining what I am seeing on lot of the beans. A worm hole that is cylinderical and deep is hard to miss but a lot of them have spots , somtimes 20 or 30, but no hole and some of the green ones have spots with dark showing under the spot. Are these spots where an insect has laid eggs that develop into worms? Also some have scabs, with some being entirely scabby. Is this the fungus? Is the fungus visible or is this something else? Also, it is easier to find slightly green beans which are filled out but without spots, scabs and worm holes. Might these be air dried after picking to get good results. The trees are not near by so I can’t go pick often. I can send photos but I don’t see anyway to attach. Honestly I do not know about the spots you are seeing. I can tell you from experience that my biggest concern was how the beans tasted. I test-tasted beans (raw) from different trees. Some were very bitter and others were sweet. Let us know how your jelly goes. Thankk you for writing and sharing. I noticed in the basket of beans on this site some look filled out but green. If dried would these be okay to use for jelly?